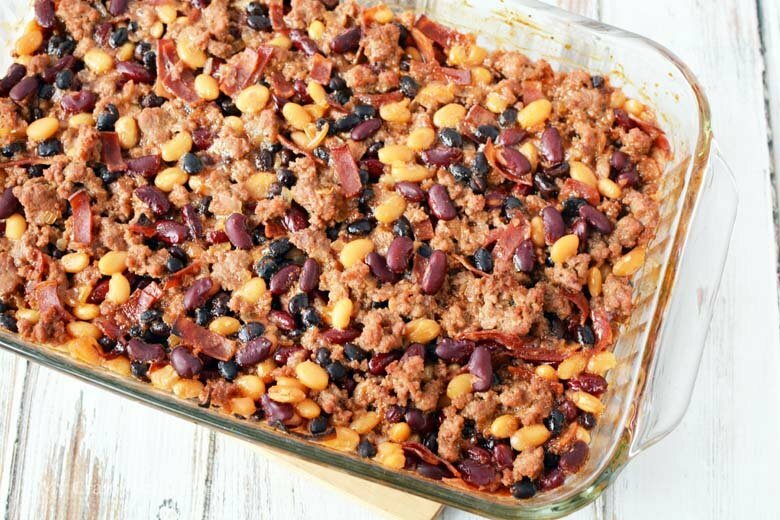 This recipe–homemade healthy baked beans with ground turkey literally makes the best baked beans I’ve ever had–it’s an old family recipe that I’ve lightened up a bit with ground turkey, turkey bacon, and a homemade pork and beans recipe instead of the canned stuff. This recipe is a family favorite, and if we’re being honest it’s the only baked beans recipe I’ll eat. I love that the ingredients are better than other traditional baked beans recipes, and the color variation of the beans just looks so much more appetizing. I’m partial to these delicious backyard BBQ recipes! Why are these baked beans healthy? I’ve reduced the amount of brown sugar in this recipe and also added the option to replace it with honey. Also, kidney beans and black beans are two of the healthiest ones you can eat–both have more then 10 grams of protein per serving, and more than 10 grams of fiber! Kidney and black beans contain almost 20% of the recommended daily allowance of iron, too. Beans are a slow burning carb that will keep you full for a bit. The sugar in this recipe isn’t the best choice, but baked beans are baked beans–they need to be a little sweet. 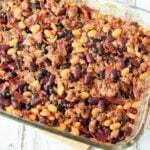 Using the homemade pork and beans recipe instead of canned pork and beans is another way to make this recipe healthier. No additives or extra sugars, no bacon that has been sitting in a can on a shelf for a year. Do you have Weight Watchers counts for these healthy beans? I do! 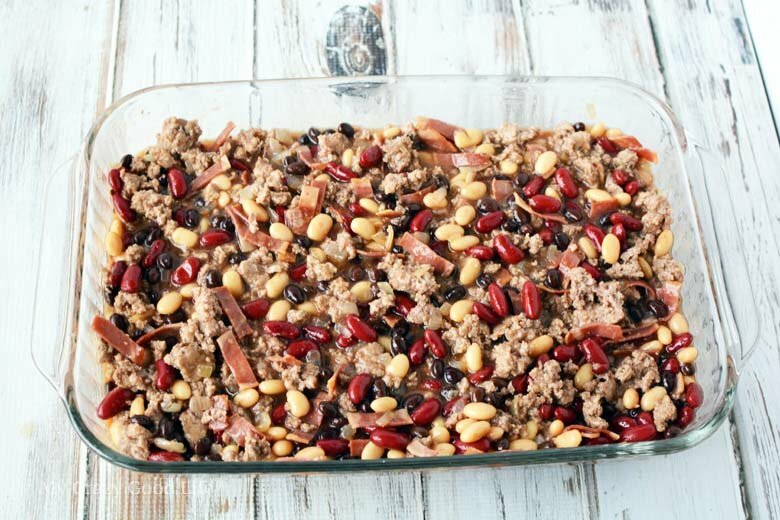 Each serving of these healthy baked beans is 4 Weight Watchers Freestyle Smart Points. They’re great for any healthy lifestyle! What are some other healthy beans? Pinto and navy beans are also healthy beans! You can easily swap them out or add them to this recipe with no changes in cook time or preparation. 1. Dice and cook the onions in a large pan. I’ve been buying frozen diced onions, and I have to tell you that they are a game changer! 2. Add ground meat to the onions in the pan. You can use ground turkey, lean beef, or even chicken for this recipe. I really think it doesn’t make a huge difference because of the amount of seasonings you’re going to add. 3. While that is cooking, add all of the other ingredients to a large baking dish. I drain the liquid out of one can of beans, then set the liquid aside in case beans look dry after cooking. If you choose to use more than 2 cans of beans, save half of the liquid for that. 4. When meat and onions are cooked, add the mixture to your baking dish and mix well. The bacon you see in this is from the homemade pork and beans recipe that I use instead of canned pork and beans. 5. Cook at 350 degrees for an hour. You could also smoke these for an hour–the flavor is delicious! 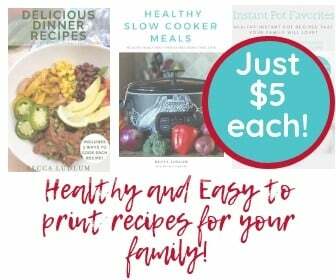 Can I cook these healthy baked beans in the Instant Pot or pressure cooker? Yes! Saute the meat and onions, then add everything to the Instant Pot. Set on high pressure (or manual) for 8 minutes. Quick release and enjoy! This homemade healthy baked beans recipe literally makes the best baked beans I've ever had–it's an old family recipe that I've lightened up a bit with ground turkey, turkey bacon, and a homemade pork and beans recipe instead of the canned stuff. Dice and cook the onions in a large pan. I've been buying frozen diced onions, and I have to tell you that they are a game changer! Add ground meat to the onions in the pan. You can use ground turkey, lean beef, or even chicken for this recipe. I really think it doesn’t make a huge difference because of the amount of seasonings you’re going to add. While that is cooking, add all of the other ingredients to a large baking dish. I drain the liquid out of one can of beans, then set the liquid aside in case beans look dry after cooking. If you choose to use more than 2 cans of beans, save half of the liquid for that. When meat and onions are cooked, add the mixture to your baking dish and mix well. The bacon you see in this is from the homemade pork and beans recipe that I use instead of canned pork and beans. Cook at 350 degrees for an hour. If using a smoker, you can easily cook them in there for an hour–the flavor is delicious! Jackie, there is no 21 Day Fix information on this post because it’s not one that I recommend for the 21 Day Fix–it has brown sugar. ALL of my 21 Day Fix recipes have container counts added to them.